Exercise and chronic low back pain: what works? 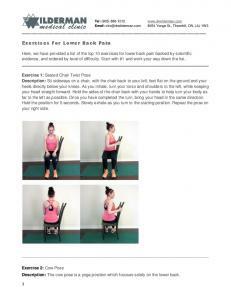 ‘Core Strength’ and Chronic Lower Back Pain. Releasing muscle tension to improve posture, alignment and movement is significantly more effective at reducing chronic or recurrent back pain than typical prescription treatment. (BMI 2009) According to Frederick Alexander, the founder of the Alexander technique, we “translate everything, whether physical, mental or spiritual into muscular tension”. The resulting poor posture compresses the neck and spine and can irritate the nerves leading out to various parts of the body. 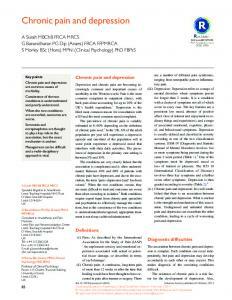 Painkillers do have their place in a treatment programme but only as short-­‐term relief. 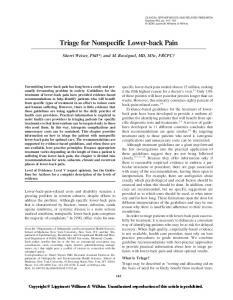 What can we do to treat and prevent back pain in the longer term? Many people advocate strengthening the ‘core mucles’. Whilst this might be helpful, in the sense that any exercise can be, it’s far too general to help people who already have a problem. People need specific advice and guidance on musculo-­‐skeletal alignment: they need to feel its effects for themselves and re-­‐ train their bodies to adopt better habits under all circumstances, sitting, standing, walking, driving, exercising. Iyengar Yoga practice encourages us to use a range of postures to become more conscious of our alignment, and of the relationship between different parts of the body. This can be as obvious as the position of a leg or arm in relation to the trunk, or as subtle as our sense of the direction of an area of skin or the angle of a joint. In this way, by identifying and correcting our physical tensions and mis-­‐ alignment, we can have a corrective effect on many systems of the body. We can easily release tension, thus correcting musculo-­‐skeletal problems, preventing further injury and pain. In terms of your ‘core muscles’, Geeta Iyengar had a lovely analogy for this. Think of a baby monkey clinging to its mother as she swings high up through the trees of the jungle. The relationship between the back of the abdomen and the spine, what we call ‘core muscles’, should echo this. Here’s a quick and easy example -­‐ are you sitting comfortably? Consider the position of the front and back of your lower trunk. The position of the pelvis is the critical factor in supporting the weight of the abdomen: everything else, including ‘core strength’, is secondary. So here’s a test for you. Lift your pubic bone up at the front and draw the back of the pelvis (your Sacrum bone) down. Now roll your shoulders back and lift your navel area up and slightly back. It shouldn’t feel hard – this is not about creating a six-­‐pack, which incidentally could just as easily pull a weak lower back out of alignment. Yoga postures to help you realign your pelvis, identify your core muscles and release lower back pain, one step at a time. These yoga postures form a simple daily routine with three key benefits: • They help to keep your lower back muscles and your spine healthy and supple. • They help to re-­‐align your pelvis, esp. the first three poses. • They will strengthen the longitudinal, transverse and oblique muscles around the front and back of your abdomen, to better support the weight of the abdominal organs. You will feel some benefits immediately, but this kind of conscious re-­‐ training takes practice, so keep it up! 1. Supta Tadasana – lie down flat on the mat, and push your feet into a wall. (Have them 4-­‐6 inches apart.) Feel how your thigh bones press down towards the floor. Become aware of the pubic bone at the front of the pelvis and the sacrum bone at the back. Draw your pubic bone towards your navel, your navel slightly inwards towards your spine, and lengthen your lower back and sacrum away. This realigns the pelvis and the thigh bones. Now fold your arms, hold your elbows, inhale and take your folded arms over your head. Breathe normally for 5-­‐10 breaths. Change the link and repeat, lifting the chest and pressing the legs down as you go. 2. Sitting -­‐ try the same alignment sitting on a chair. Draw your navel back towards your spine, lift your chest and take your shoulders back. Feel better? What you have just done is to lift your lower abdomen up and lengthen your lower back down, which levels the bones of your pelvis and puts the weight of the abdomen into the ‘bowl’ of the pelvis, where it belongs, instead of dropping over the front of your pubic bone and giving you a belly! Lifting your chest and taking your shoulders back makes more space around the front and back of your abdomen, keeping this girdle of muscles firm, and of course relieving the pressure on your digestive organs. REMEMBER: this is not about creating a hard abdomen: it’s about realigning the skeleton-­‐muscular structure. 3. Bharadvajasana -­‐ sit sideways on the chair, feet flat on the floor and knees pressed together, with the back of the chair to your right. (If your feet don't reach the floor, place a block under your feet.) Repeat the abdominal lift as above. Then, keeping your knees and hips steady, turn your trunk towards the back of the chair and hold with both hands. Keeping your knees and thighs together, push gently with the right hand and pull with the left, so your trunk turns and your spine revolves. Keep your shoulders level, breathe steadily, and keep your chin in line with your breastbone. Hold for 3 breaths. Slowly turn to the front and pause for a breath. Swivel round on the seat so the back of the chair is now on your left. Repeat to the right and left once more, pausing between each twist. (Ladies: Miss this one out if you have your period.) 4. Navasana -­‐ face the seat of your chair. One at a time place your heels on the seat, holding a strap round the soles of your feet. Begin to straighten your legs. Tightening your kneecaps and extend the backs of your legs, pushing your heels away, and pulling on the strap with your hands. Learn to lift your chest, waist and lower back away from the floor. Keep your head, neck and face relaxed. Breathing evenly and smoothly, hold for 3-­‐5 breaths. Relax the pose, bring your feet down if you need to, then repeat twice more, rolling your shoulders back as you lift your chest. Try to perch on your buttock bones! If you find the chair too high to start with, use a wall and gradually work your way up to chair height. 5. Jatthara Parvatasana -­‐ lie down on your mat. Bring your knees up over your chest and push gently into your heels, keeping your legs firm, your feet and knees gripped together. Place your arms on the floor, straight out at shoulder height, backs of the hands to the floor. Keeping your knees together (that’s the tricky part!) and well bent, roll them slowly to your right and left, keeping a slow and steady rhythm to the movement and the breathing. Keep your face and jaw relaxed. Repeat this three times on each side, then rest with your feet hip width apart on the floor, knees bent and together. Repeat for three each side again. 6. Urdhva Prasarita Padasana –lie down on your mat with your knees bent up. Lift your hips and put a yoga block under your sacrum. (Have a look at the previous picture.) Bend your knees over your chest and put a strap over the balls of your feet, holding one end in each hand. Breathe in. As you breathe out push your heels up towards the ceiling, keeping your feet together and aiming to straighten your legs. The shorter your hamstrings, the more challenging this will feel. Hold this ‘L’ shape for 2-­‐3 breaths, and then bring your knees back down to your chest on an exhalation. Rest for 2 breaths. Repeat this three times. If you find it difficult to straighten your legs, take your legs and feet further away from your face by using a longer strap. Experiment until you find an angle at which your legs feel comfortably straight, backs of the knees open. You can also rest your heels on a wall, as with Navasana. Finally put your feet down on the floor hip-­‐width apart, knees bent and together, to allow your abdominal muscles to rest. Eventually, lift your hips and slide the block out, and rest your back on the mat. 7. Legs over a Chair -­‐ lie with your back on the floor and your legs resting over the seat of the chair. (Put the chair sideways so you have room for your feet.) The edge of the seat should come right into the backs of your knees, so your calves rest completely on the seat. If you are less than 5’6” you might be more comfortable with a yoga block under your sacrum. If you are over 5’9”, you will find a well folded blanket on the chair seat more comfortable. Your thighs should be slanting slightly away from the chair. This particular pose relived a tight lower back and relaxes the spinal muscles. 8. Savasana -­‐ To finish, lie with your back on the floor. It’s important to release the whole spine. You may be more confortable with your knees over a rolled blanket or bolster. Stay resting for 3-­‐5 minutes, keeping the mind quiet and breathing normally. 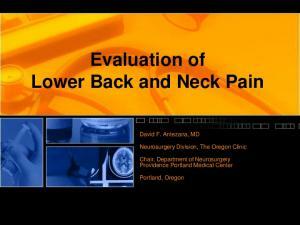 Report "Core Strength and Chronic Lower Back Pain"